We are having unseasonably cold weather (after last week's unseasonably warm weather) and last night was the first time I've put on a pair of tights since last winter. We're now officially back to the land of layering. 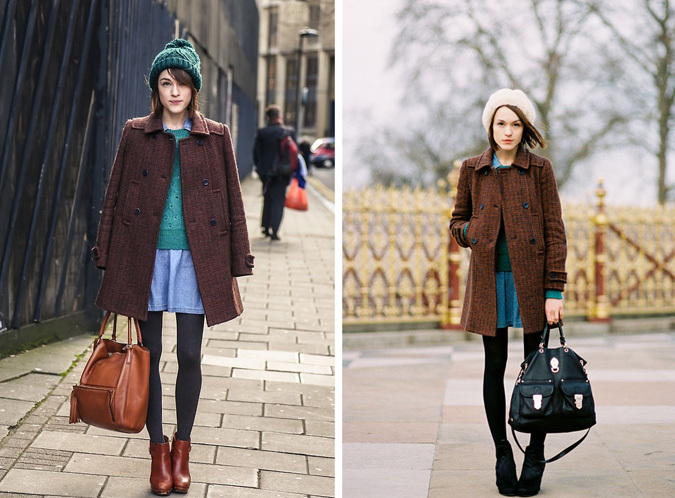 I wasn't quite prepared for the thought of wearing tights again so I looked through my Fall/Winter Pinterest board, in order to remind myself of what an outfit that involves layers looks like! As I was skimming over the photos, I happened to notice these pairs of images featuring the same gals twice. I really like how they show the advantages of finding a silhouette that works for you and reusing the pieces in your closet. The photos above feature the exact same outfit with only the accessories changing. The photos below show some of the pieces being reused while creating a new outfit with the same silhouette. I'm definitely going to keep this in mind while thinning out my closet for the season. Mmmmm browns... And thanks- now I have your pinterest to follow! the first two the gal is Ella of La Petite Anglaise. She's quite active in the fashion scene. All of these looks are great! I can't wait for it to get colder, so I can layer like this. I love all of these looks. I can't wait for it to get colder in Florida, so I can start layering like this.